We’re sure you’ve had that feeling when you see a new invention trotted out by a big company, that moment of, “Hey, I totally had that idea first!” A Michigan entrepreneur took that feeling and turned it into a lawsuit against H.J. 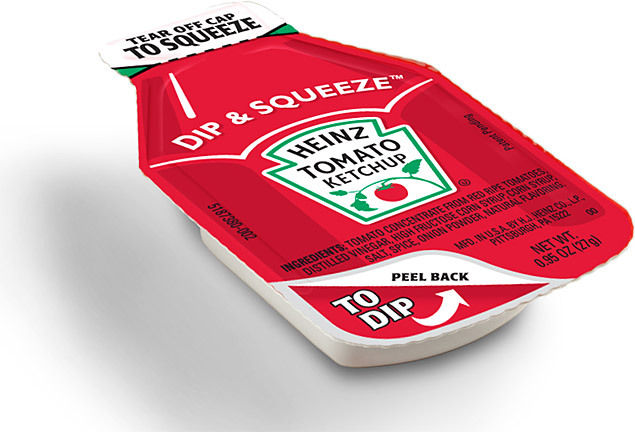 Heinz Co., saying the company ripped off his invention when creating its “Dip & Squeeze” ketchup packets. The Michigan man claims he patented the”Little Dipper” condiment package back in 1997, reports the Associated Press, and that Heinz took his idea and turned it into the Dip & Squeeze packets, which debuted in February 2010. The trial started yesterday in a federal court in Pittsburgh, and is expected to last through Thursday. If the jury decides Heinz used the man’s “concrete, new and novel” ideas when it developed the packets that can both be squeezed or used as a container to dip things into, there will be another trial in June to determine how much Heinz owes him. The man’s attorney can’t say how much his client is seeking because the expert hired to calculate that amount hasn’t come up with a final number yet. He isn’t claiming that Heinz copied his design exactly, but instead that the company didn’t have the idea for its own container until he pitched it to the folks there. Heinz’s attorney denies that claim. The entrepreneur sent a letter in March 2008 to then-CEO William Johnson and met with Heinz officials a few months later, his attorney says. Heinz isn’t denying that the meeting took place, but said the discussion had nothing to do with the Dip & Squeeze.